I FINALLY GET IT. I finally get why they call Rwanda the land of a thousand hills. I thought I understood this statement when we walked around the streets of Kigali last week, but our weekend getaway over the last two days proved that this statement represents something much, much more grand. Sidenote: I apologize in advance for the length of this post… There were just so many moments that happened over the course of the weekend that were worth noting down, and sharing! Jamie, Chris and I woke up early on Saturday, and taxied to the Kigali bus station, a place bustling with over 50 mini bus companies, each with its own brightly coloured stall. 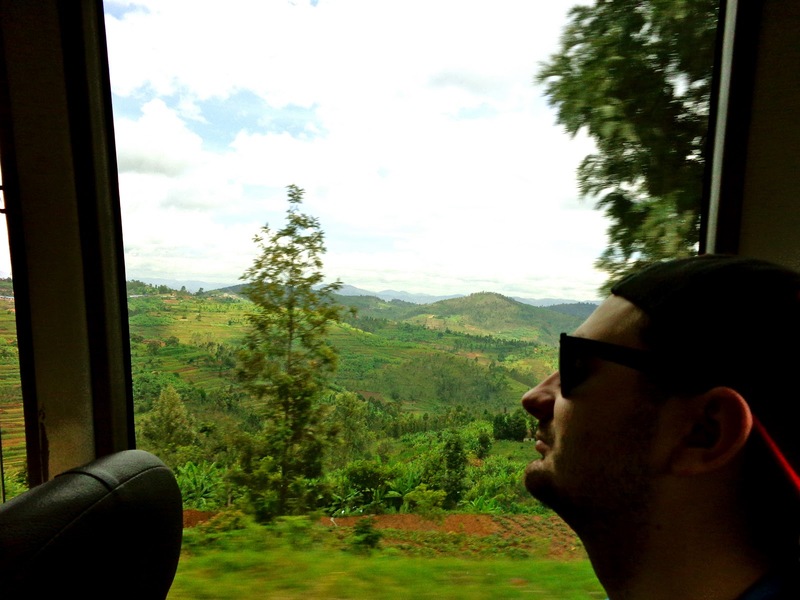 We paid a bus fare of 2500 RwF (~$4 USD) for the local bus, and embarked on the three hour trek to Kibuye. For the first half of the trip, I had to sit on a fold-out middle seat, with a small backrest. I learnt that I need to work on my upper body strength, as I was flailing around from side to side each turn we took. The boys rested for a bit, but for the most part we just stared out the window, in utter amazement. Describing the hills won't do them justice, but I assure you, they are amazing! Driving along the windy road, one can just see layers upon layers of rolling hills, in the most vibrant green shades. Because we're so used to flat lands back home, one of these over in Ontario would be considered a mountain, as they're so high, and are even steep enough to be ski hills! The drive reminded me of a mix between Highway One in California, with the road right on the edge of a cliff, and the Road to Hanna in Hawaii, with the extremely windy roads. The three hours flew by, and the entire ride was absolutely breathtaking. When we arrived in Kibuye, 12 moto-taxis surrounded us asking if we wanted a ride. We wanted to stroll through town though, and they followed us for a good five minutes before realizing we were adamant on just walking around. We felt pretty good about ourselves for committing to our walking plan, but soon realized that we had walked 25 minutes in the wrong direction, and that our hotel was over a 45 minute walk the opposite way. We were also told that there were no car taxis that could take us all the way to our hotel, and that we'd have to take a moto-taxi. So we waited, as they had all left us a while back, and finally flagged down three motos. And I went on my first motorcycle ride ever! It must have been quite the sight: the three of us sporting bright red helmets, straddling the motorcycle drivers and holding on to them for dear life! I was pretty scared at first, but we made them promise to go slow, and it was truly a great time! 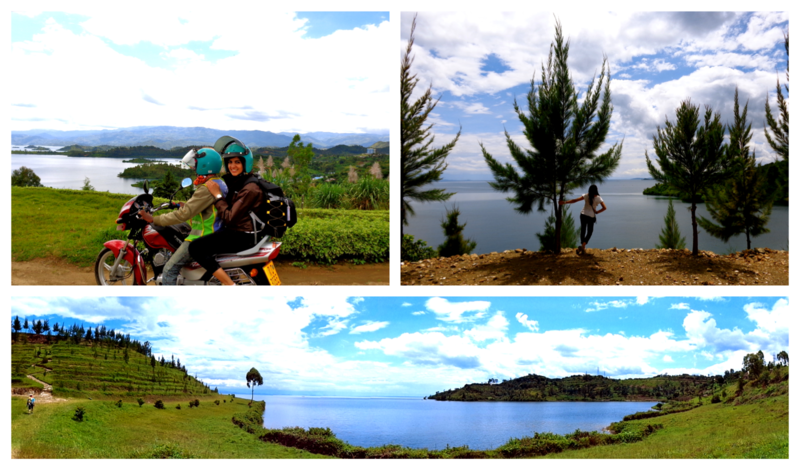 The roads this time were on the edge of the cliff over the gorgeous Lake Kivu, so it was quite the incredible scenery for my first motorcycle experience! We arrived at our hotel and again were absolutely stunned at the views. This trip just did not disappoint! We stayed at the Hotel Saint Jean, a boutique hotel right on the cliff overlooking the lake. We ate lunch at the hotel's quaint cafe, and discussed how in ten years this place will probably be super expensive, as it's so remotely situated, has the most stunning views, and has an old stone home charm to it. For now though, the boys paid just 4,000 RwF (~$6 USD) each for a room with two beds, and I paid 10,000 RwF (~$17 USD) for a single room with an attached bathroom. I'd say we got a pretty great deal! 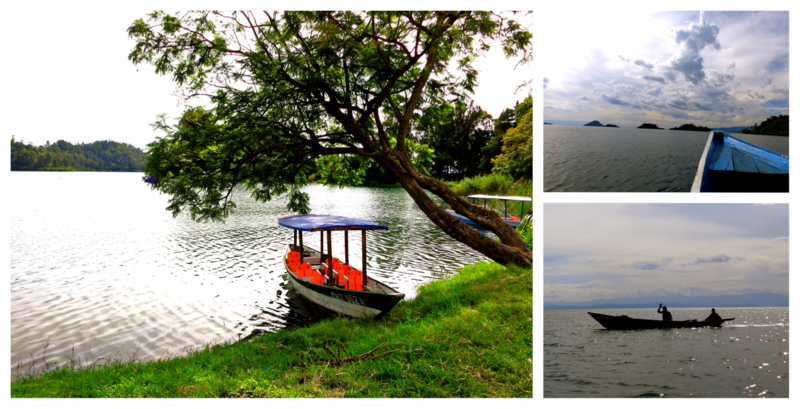 In the afternoon, we took a boat ride in Lake Kivu, which was simply stunning. 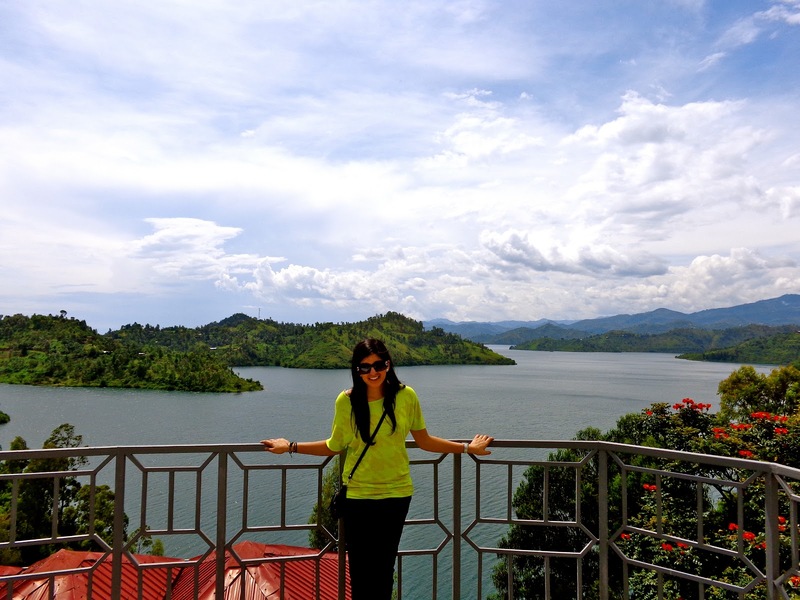 Lake Kivu is a gorgeous lake, with many small islands, and a view of the Democratic Republic of Congo in the back. 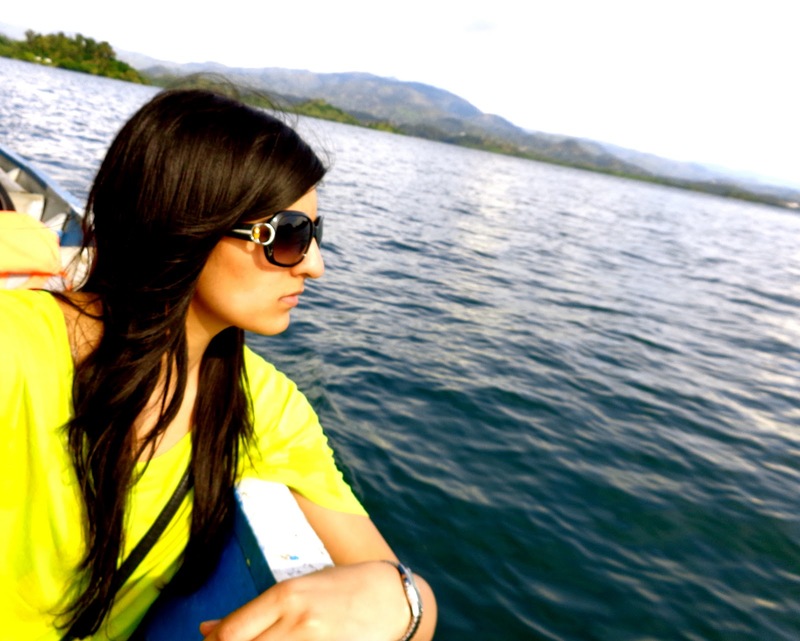 The boat was pretty creaky, but aside from those noises, it was so nice just sitting there on the edge letting the wind blow through our hair, with nature all around us. 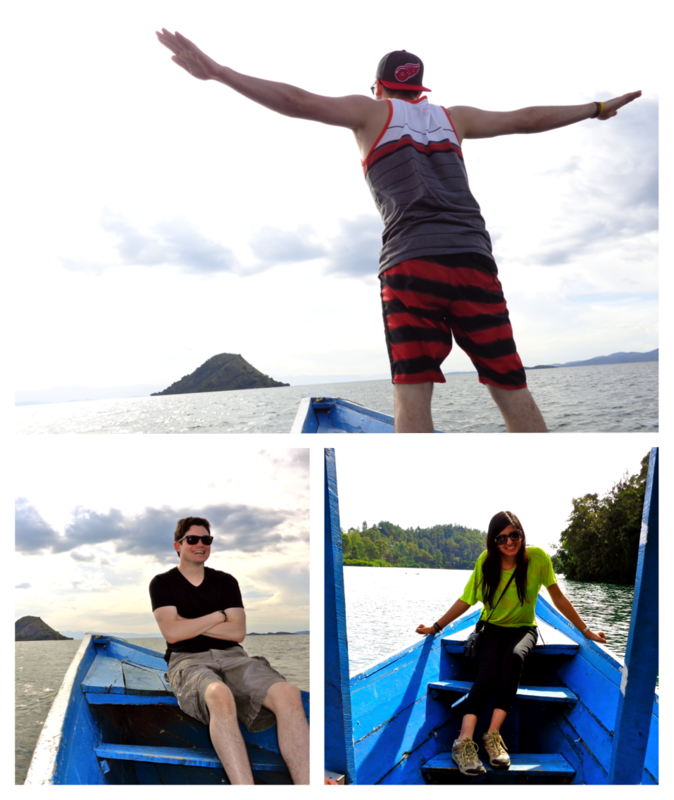 About an hour into our boat ride, we stopped at the island nicknamed Napoleon's Island, as it is shaped like his hat. We hiked through the jungle, climbing up some rocks and ducking under trees. Earlier in the day I had regretted not bringing shorts as it was so hot outside, but once we started the hike, I was thankful for my long pants and running shoes, as there were some very sharp plants that brushed up against our legs! When we got to the top, our boating assistant told us to wait a moment as he climbed a bit higher and started clapping. All of a sudden, giant bats started flying out from the trees all around us! 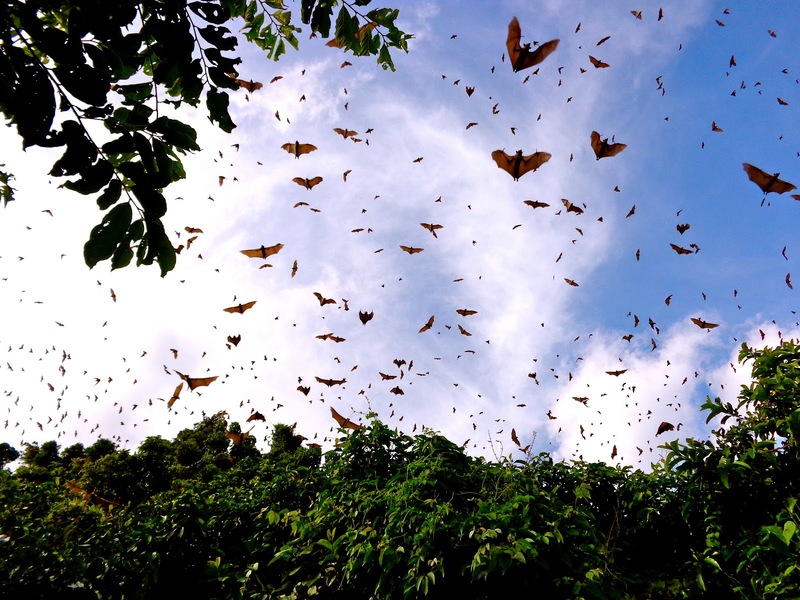 It was such a marvellous sight: hundreds and hundreds of bats were circling above us, all of them darting back and forth, squeaking loudly! As punishment for us disturbing them, many peed on us as they flew out from their trees. It was gross, but SO worth it! We made our way back, and were frustrated bargaining as the boating assistant tried to change the price on us. About 150m from the shore though, the gas ran out. The driver, who had been so nice to us the entire time but had remained quiet during the bargaining, quickly stripped down to his swim suit and dove in - he started pushing the boat to shore! Chris had been wanting to go swimming for some time, so he quickly joined in and started pushing as well. They were both absolute tanks out there, and it definitely helped our argument in the bargaining once we finally arrived on shore! In the evening, we freshened up, explored the gardens around the hotel, and then enjoyed dinner with members of the Peace Corps from around the US. They were in Kibuye for a meeting, as they're all volunteering in remote villages in Western Rwanda. We enjoyed the view of the lake at dusk, had some great conversations, and overall it was a GREAT DAY! This morning we woke up early and I had my first taste of tropical fruits. My parents always rave about the sweetness of the fruits in East Africa, and I never really understood how fruit could be even sweeter than the stuff we get at home. But alas, this stuff was delicious. 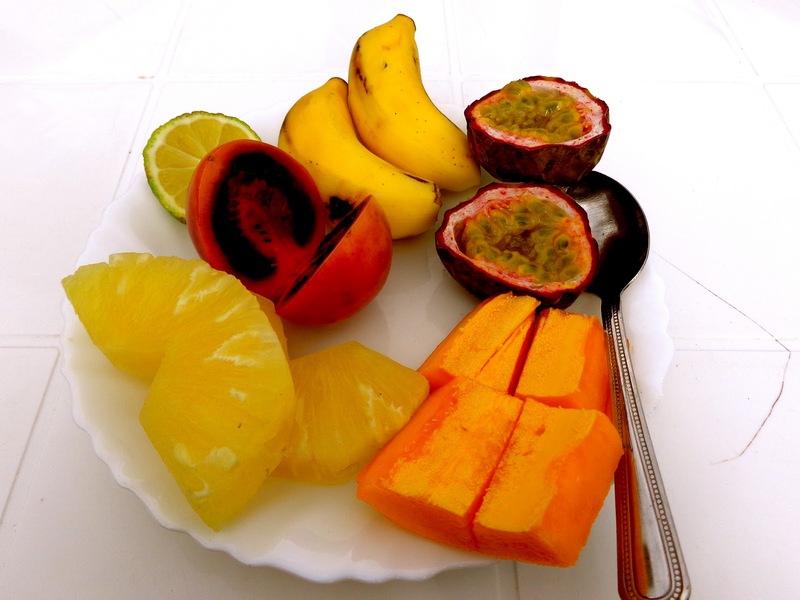 I had the mini bananas, sweet tomatoes, papaya, the juiciest pineapples ever, and my personal favourite, passion fruits. What an explosion of flavours my breakfast was! After checking out, we moto-taxied our way to the gas extraction sites to see what they were all about. 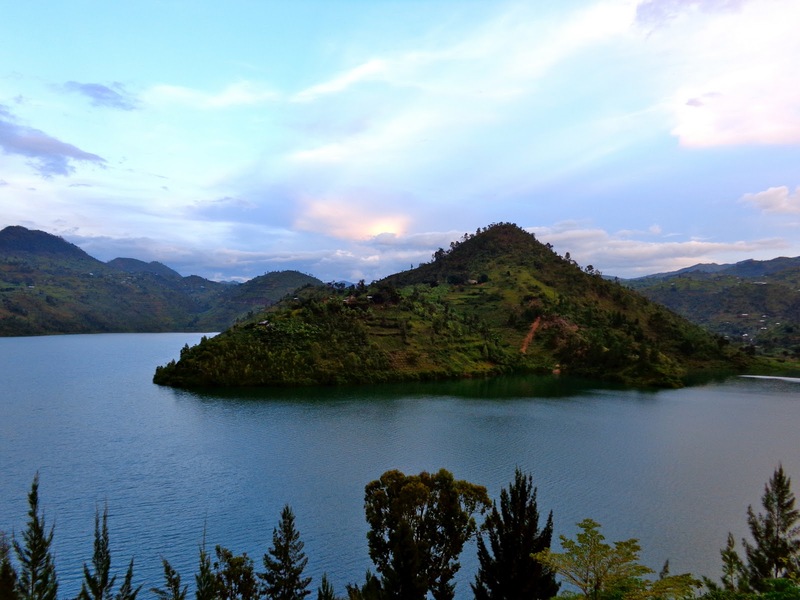 Essentially, there is much methane gas under parts of Lake Kivu, that is extracted and converted into power, just outside of Kibuye. The plants were all closed, but it was another fun ride on the motorcycles to get there. We stopped at the village known as Luisa, and walked around for some time in the hills. We trekked up a zig zagged path up a very well maintained hill, and found it completely deserted up top. There was a beautiful gazebo at the edge of the cliff and we just sat and relaxed for a bit, breathing in the fresh air. I wanted us to sit in silence for just one minute, but every 15 seconds or so, someone decided to talk. In the end after many failed attempts, we were able to sit in silence for a good two minutes, just in quiet contemplation. It was a really special moment up there. We hiked down, even more out of breath than our normal out-of-shape selves, due to the high elevation, and met our moto-taxi drivers outside of the village. 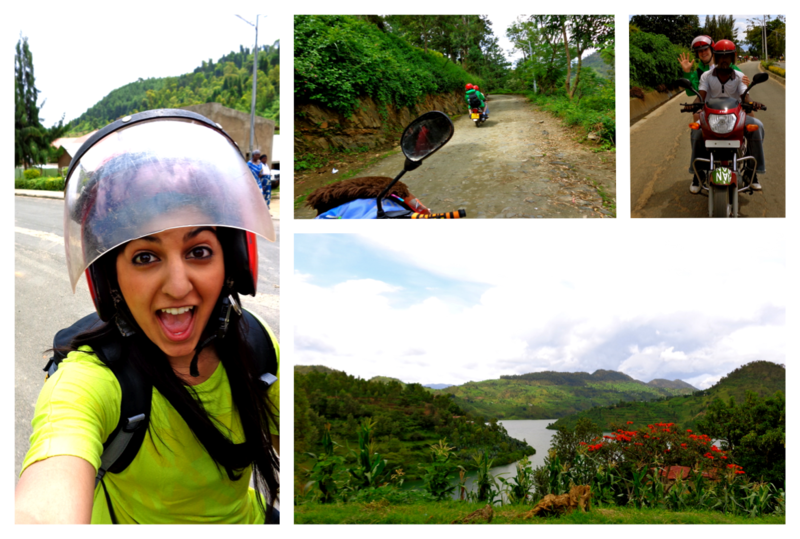 We enjoyed the scenery on our last motorcycle ride through the country side, and I even felt comfortable enough to take my hand off the driver's shoulder and have both hands holding just my seat, like the locals. He took this as a sign that I was finally used to being on a motorcycle, and sped up. I was saying a silent prayer the entire way, as I was shocked at how fast he could go, but he was being very safe, so I plopped the visor down in front of my face, held on tight, and enjoyed the ride. It was definitely exhilarating to say the least! Since it was so hot outside today, we each enjoyed a cold coke before embarking on the three hour bus ride back to Kigali. We ensured ourselves good seats by waiting an extra hour in town, so we roasted even more in the sun, but it was worth the wait. The ride was of course just as beautiful on the way back, and we enjoyed interacting with some interesting characters on the bus, including some adorable babies sitting around us. At least, we thought they were adorable until the one sitting on his mother's lap next to Jamie started throwing up. Some of it hit Jamie's leg and seat, so we ended up sharing my seat for the last hour as his was pretty gross.